Do I like kale? | Small, but valuable. Okay, I know I’m writing about kale again, and I keep saying I don’t like kale. In theory, that is true. The not liking thing. You just have to put tasty things that I love with kale, and then I can pretend to get along until the end of the meal. So what tasty ingredients tricked me into eating kale this time? Yesterday, it was a smattering of cheese, tomatoes, and most importantly, fresh dill and Kalamata olives, which were all expertly combined in this recipe from Sprouted Kitchen. The only sad thing about the recipe is that we were running short on Kalamata olives, so I couldn’t double the quantity of olives like I do in many recipes (while scarfing them down as quickly as possible between chopping of olives that might eventually make it into the recipe). Which was a pretty big win. 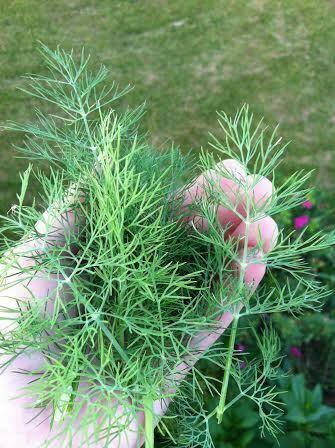 Not all of our herbs sprouted, but our dill and cilantro are trying to make up for that by growing in leaps and bounds. Two healthy herbs isn’t that bad. 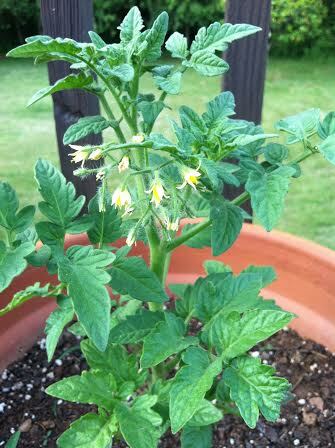 And we even have hope for cherry tomatoes in the very near future. And we had a very healthy salad next to our very healthy maters (above and to the left of the maters, to be precise). And the salad had cheese, which almost made up for the small quantity of olives. Try it out. 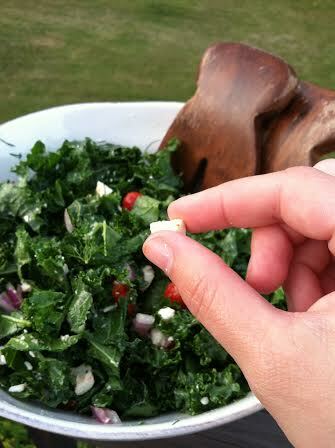 The small chop of the kale helps if you don’t love the texture of kale, and the dressing makes it a bit softer. The dill and veggies and such took the taste to deliciousness. (Oooh, and I threw on some pre-cooked chicken at the last minute to bump up the hearty factor of the salad.) And there you go. 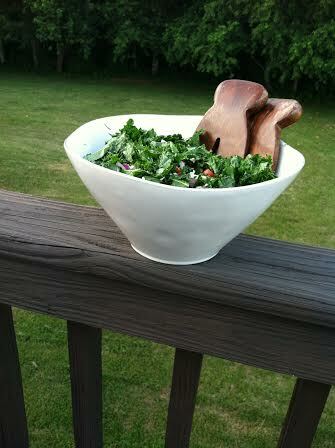 A healthy salad that masks kale enough for the naysayers in your life, even if you are the naysayer yourself.